After Ryan proposed on October 3, 2009, he surprised me by having both of our families waiting for us to enjoy dinner on a private dock at one of our favorite restaurants. 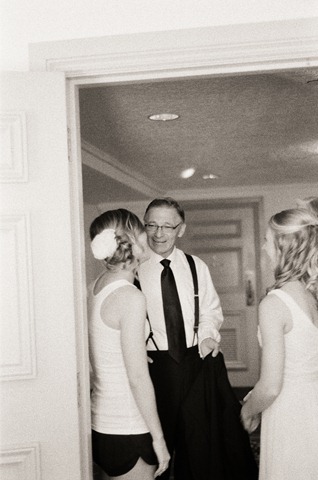 It was that evening where I first got a little glimpse into how my father would handle our upcoming wedding. On the night of our engagement, he was excited, emotional, loving and beyond supportive. These characteristics remained with him through our wedding day. On the outside my dad is a tough businessman. 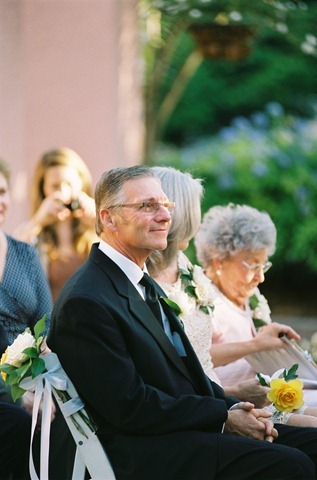 He works long hours, and has a seemingly intense personality, but his tough-guy exterior immediately begins to fade when he talks about me, my mom and my sister … "His girls." As my dad’s oldest daughter, I was the one who had to break ground on the whole "boyfriend" thing. I remember the first Homecoming dance I attended with my good friend, Steve. "Is he your boyfriend?" my dad asked. "No. He’s just a friend." "No. Seriously, he’s just a friend." We arrived at my friend Steve’s house for pictures and my dad pulled me aside, loudly whispering, "Julie! He has an earring!" The second memorable boy-related conversation I had with my father occurred during the beginning of my sophomore year in high school. One night at the dinner table, I broke the news to my family that I had a boyfriend. My first real boyfriend. The conversation didn’t get too involved and we continued eating our meal. About an hour later, I was upstairs in my bedroom, working on geography homework when I heard a knock on my door. My dad entered and sat down at the foot of my bed. "What does this mean?" He asked me. "What do you mean you have a ‘boyfriend?’"
"It’s nothing really, Daddy." I said, treading with caution. "So why are you calling this guy your boyfriend? What do you mean by that?" "He’s just a guy I like. It’s not a big deal." "You’ve never called anyone your boyfriend before." "Yeah, well, it’s a little different." This went on and on as I tried to assure him I wasn’t running off to get married at the age of 15. At the age of 25, things were a little different. I was in love with a guy he liked and respected. Hearing the way my dad talks about Ryan warms my heart in the most intense way. Hearing the way he talks about me and Ryan together shows me how much he believes in our relationship. 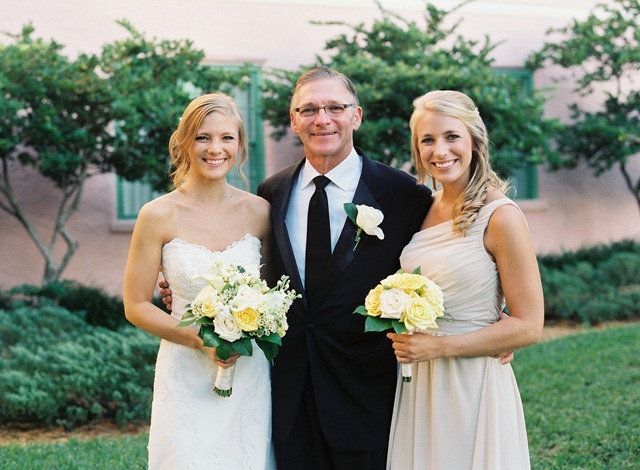 Throughout the wedding-planning process, my dad was so generous and supportive. It was so clear that he wanted our wedding to be the wedding of our dreams. 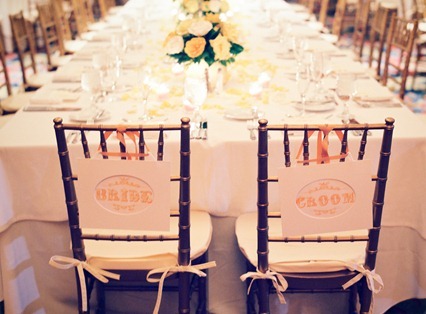 He even let me get the chiavari chairs. And he gave me these adorable sneakers, reminiscent of Father of the Bride, our family’s favorite movie. 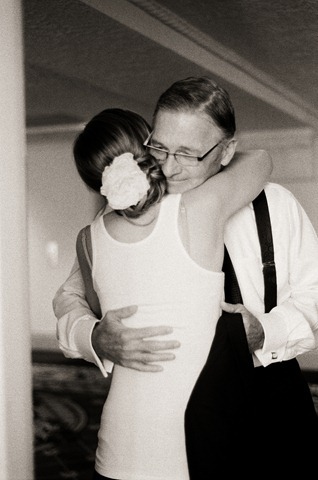 During the rehearsal, and on our wedding day, I think my dad was the most emotional of everyone. He had a calm, happy smile on his face but tears in his eyes throughout the whole weekend. 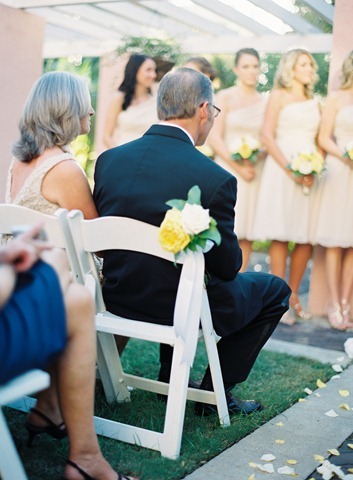 As he prepared to walk me down the aisle, I remember him taking a deep breath. His exhalation was shaky and his smile was a little timid, but very pure. He walked me down the aisle and placed my hands in the palms of my future husband. As the ceremony progressed, my dad watched me exchange rings with Ryan and listened to us as we said our vows. Our photographer managed to capture this magical moment in perhaps my favorite of all of our wedding photos. When I first saw this picture, my eyes welled up with tears. 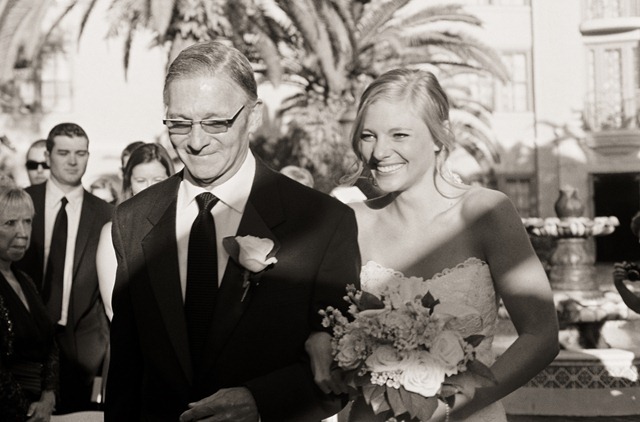 The emotion on my dad’s face is so apparent and breathtaking. The look of love has never been more pronounced. I’ve been reading your blog for a while and enjoy all of your fun recipes and beautiful wedding photos. Congratulations. I went to see the new Harry Potter movie the other night (not sure if you’ve read the books) but there is a scene were the characters Bill and Fleur are having a wedding, and guess what chairs they had at the reception? Yep, the chiavari chairs. They really are magical! I am definitely crying. 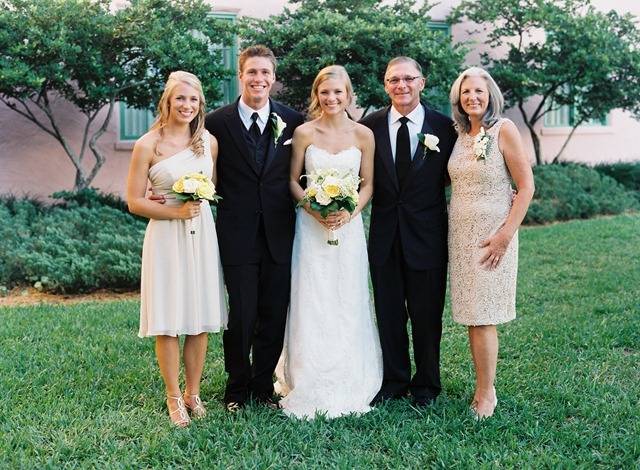 I am the oldest child too, and I will probably be the first one to walk down the aisle. I’m afraid that I will be a mess because it’s such a bittersweet moment…I know my boyfriend does not take the place of my dad, but that’s how it feels sometimes. It’s hard growing up! I’m a new reader, so forgive me for being late on the comment game, but what a beautiful post! I feel like giving away his daughter must be both tough and exciting for a father, and I’m sure he really appreciates this reflection from you! P.S. 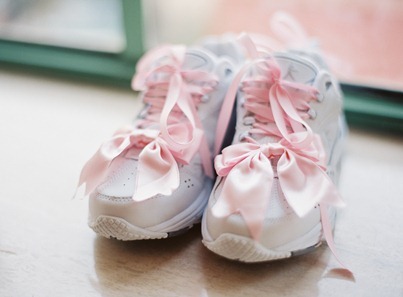 I wore bedazzled tennis shoes at my wedding, too, a la Father of the Bride! This post make me tear. Love it. wow. so i came across your blog because i was looking up recipes… but here i am now crying ridiculously over a couple of strangers and their wedding. you and your husband and family remind me of myself and my boyfriend and our families. and that alone makes me believe you guys are really genuine and happy and, honestly, lucky. your wedding was beautiful and literally had me in tears reading through it all. spread the love. there needs to be more people like you all in this world.